Our tribute to a classic cover (look it up to see how classic--if you don't know the history of this particular EC Comic, it's definitely worth reading up on. You can Google it now or wait until this comes out next Spring and read more then), courtesy of Gabriel Rodriguez. 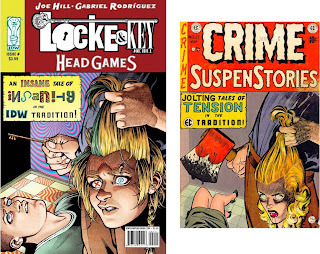 Cover idea and inspiration came from Joe Hill, the series' creator. I normally wouldn't show anything this far in advance, since the second LOCKE & KEY series (HEAD GAMES) doesn't launch until January, and this cover is for issue 3, but I can't keep something this good under wraps. Perhaps aside from Franco Urru, Gabriel Rodriguez is my far and away my favorite comics artist. January for the second series ? Wonder if he can do likenesses?